Does laundry seem to be taking over your child’s nursery or bedroom? The 3 Sprouts laundry hamper is the perfect solution. Two large handles collapse, creating a circular opening that stylishly keeps dirty laundry out of sight. And when you’re ready to go, simply lift the handles and tote your laundry away! The base is made with a breathable mesh fabric. Our laundry hamper is completely wipe able and folds flat when not in use. 3 SPROUTS: Does laundry seem to be taking over your child's nursery or bedroom? The 3 Sprouts decorative laundry hamper is the perfect solution. Two large handles collapse, creating a round opening that stylishly keeps dirty clothing out of sight. EASY TO CLEAN: Face it, accidents happen! Your baby girl or boy is subject to the same rule, no matter how perfect they are. Luckily, the 3 Sprouts laundry hamper is very easy to clean. Just wipe off your toddler's mess with a cloth when it occurs! MATERIALS & SIZE: Made of 100% Polyester and 100% Expanded Polypropylene, this laundry hamper is bound to last a long time! At 19 inches tall, with a width of 22 inches and depth of 11 inches, the hamper will fit perfectly in your kid's room. FOLDS FLAT: The 3 Sprouts laundry hamper makes for a convenient storage basket for dirty clothes. When not in use, you can fold it down so it doesn't take up as much space. 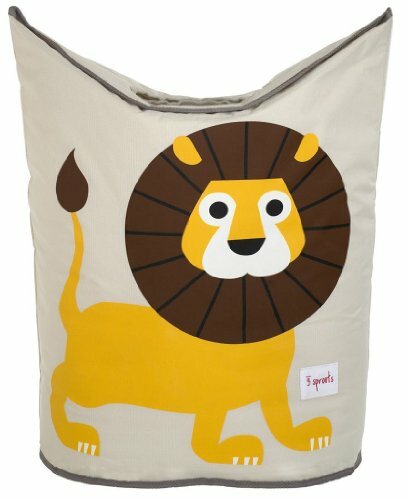 The super cute collapsible basket can fit anywhere in your child's nursery. TWO HANDLES: The foldable animal bin is designed with two handles, making it easy to use as a bag. The handles not only give the basket a cute design, but make it much easier to carry. This hamper is an essential baby accessory for parents.